We do not border the park directly, but it is just a short ride to several trail heads. With over 200 miles of different trails in the park,and miles and miles of trails outside the park, there are many miles of wide trails, and many miles of more challenging trails. There are long hard rocky climbs out of the river or tributary creek gorges, some big mud holes, plenty of washed out, eroded areas, but for every mile of bad trail, there is at least 20 miles of good trail. 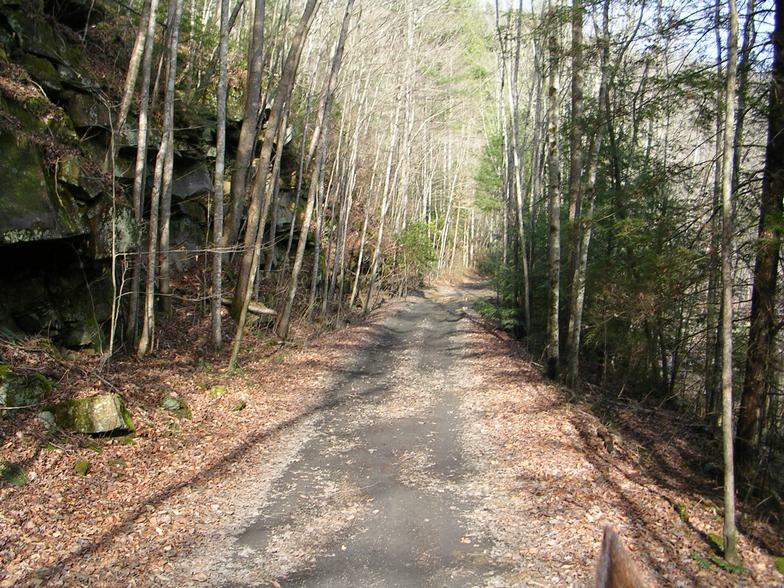 Big South Fork National River and Recreation area is located on the Cumberland Plateau, this is a short flat topped mountain range, some people call table land, we are at about 1650' above sea level, the park is built around The Big South Fork of the Cumberland River. The river has cut a deep river gorge into the plateau, and there are awesome rock formations, natural sandstone arches, waterfalls, and overlooks at the top of high cliffs where you can look out over thousands of acres of remote rugged wilderness. This is not a "city park", don't plan on coming up here one time, and seeing everything, you'll probably go home disappointed, unless you are going to stay at least a week, it takes a lot of riding and exploring to figure out the best way for you to enjoy this area, I've been riding here almost 20 years, have done 5, four day , 80 mile back country rides, and I still discover something unknown to me all the time. The park is maintained by the National Park Service, the main visitors center is called Bandy Creek, the trails around the visitors center and close to central part of the park are well maintained, and you could and can drive a 2 wheel drive truck on some of them, others are true horse trails but usually well maintained, but the further away you get, the trails can get rough. Saddle Valley is located just to west of the park entrance, the park wraps around our area, and although we do not border the park, we have our own trails, and share trails with the community, it's not a case of having to get off and open gates, there are actual trails designated for horses, some time you have to cross Leatherwood Ford Road, which is the main road through the park, and there are places you ride beside some gravel or what is known as tar and chip, but most of the time they are dead end roads with little or no traffic. If you visit our website at http://www.saddlevalleycampground.com/Trail-map.html all the green is what you can ride from our campground. We have loops from 2 hours to 4 days. 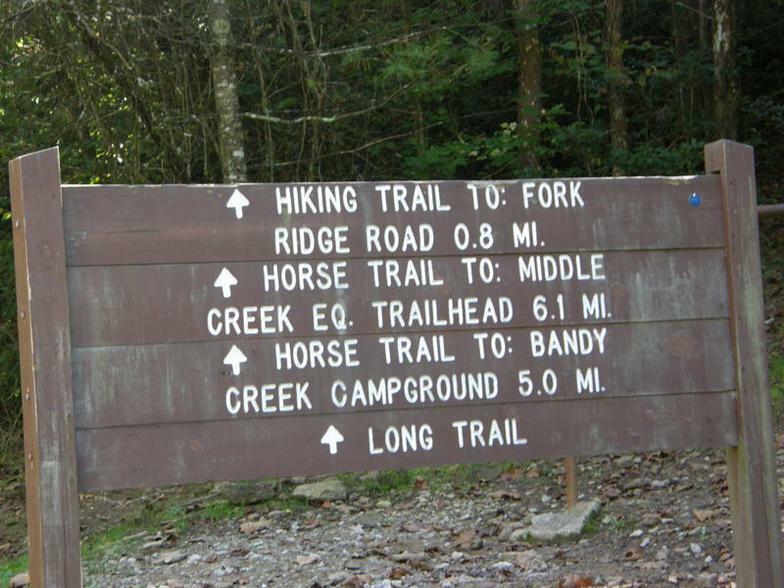 It is less than a mile to the main trail head on the west side of the park, and only a total of 7 miles to Bandy Creek from your campsite, so we get the benefit of riding the well groomed easy trails, but we also have access to more remote parts of the park, you can ride into the park on at least 5 different trails Our campground is located at the end of a dead end road, with very little traffic, we have very shaded sites, with hitching post at most campsites, you are allowed to bring your horse to your site, there is room for them to stand and graze, we love the free lawn service, the fertilizer does not bother us either, we got pitch forks and wheel barrows, and I ain't never seen a healthy horse that don't poop! 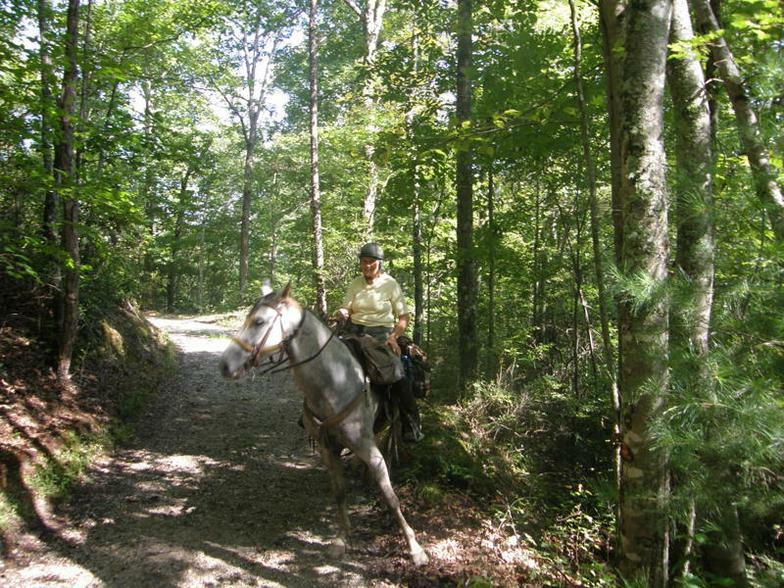 We are horse people here for horse people, we've owned the campground for over 10 years, and have been riding up here for almost 20, we know the area, and have learned much of it's history. We have an open and personal relationship with the park and several of the park employees are our neighbors. With 26 campsites, 43 stalls, and 8 paddocks, we are big enough for medium sized groups, yet small enough for personal one on one service, most of our customers become good friends, and return year after year, from as far away as up state New York, and southern Florida.